With most radios, the built-in if-amplifier and demodulator is good for audio and speech but not suited for fast 9600 Baud data reception. For all transceivers with 455 kHz second IF frequency this problem can be solved easily and inexpensively by adding a IF-amplifier / demodulator 'ZFD'. The small board (37 x 37 x 20 mm) fits into most transceivers. The Yaesu FT736R transceiver, used with most satellite stations, has a FM-demodulator with narrow bandwidth ceramic discriminator, which makes problem with most 9600 baud signals. With the ZFD, the FT736 becomes the perfect station for 9600 and 19200 baud operation. 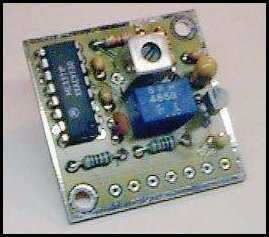 The IF-amplifier / demodulator ZFD had been tested by James Miller, G3RUH. James recommends to add the ZFD as enhancement for all satellite-receivers, especially for YAESU FT736. Because of the wide bandwidth of ZFD, the expensive compensation of doppler-shift-effects may be omitted with satellite receivers. The IC is suited for data rates up to 38400 Baud. Other similar types can be used up to 4800 baud only! The IF-Filter is designed for optimum data reception and flat group delay with rates of 9600 and 19200 baud. IF-output of the radio (tap after second mixer at 455 kHz) goes to pin IN1. Normally the IF output of the radio is connected directly to the input of the ceramic filter of the board. Use a short shielded cable to connect IN1 to the radio. Only with high levels of 455 kHz output from the IF stage use IN for connection, which goes through voltage divider R1 / R2.